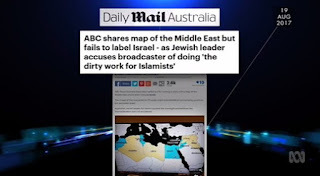 The Australian Broadcasting Commission (ABC) – taxpayer funded to the tune of $1 billion annually – still continues to feature a map which falsely identifies “Israel” as “Palestine”. We have issued no apology, retraction, correction or amendment to this item." When I clicked on the link supplied by Whittaker, I noticed that 20 or more posted comments – including mine – had all been removed. “You’re welcome to re-post the comment. We apologise if a technical error removed it. 'Thanks for your response and the suggestion I can re-post my comment. What about reposting the more than 20 other comments that were removed by "technical error"? Are they too irretrievable? "But two days is obviously an age in the Mail’s hectic newsroom. And clearly no one bothered to watch the ABC report. Because if they had they would have known that the nations in blue are where this law has been abolished. And the nations in yellow are those that still have it on their books. And Israel was not on the map because it never had the offending statute." 3. Israel was mislabelled "Palestine"
Paul was clearly in error in making the above statement. Where he got the information to make this statement needs to be explained by Paul. The segment was clearly tainted by this statement. "As for the story itself, like I said, we stand by it and have nothing more to add"
With the greatest respect – I think you do – especially as the segment involved an ABC program – The World – where an incorrect map bearing an ABC logo was used – indicating someone in the ABC had prepared it for specifically for The World program. Your website proudly proclaims: "Media Watch has built an unrivalled record of exposing media shenanigans since it first went to air in 1989." On the face of it Media Watch and Paul Barry appear to have become unwitting victims of shenanigans within the ABC – having been fed false information which was relied on by Paul to make the offending statement which – if true – would have certainly debunked the Daily Mail story. However the statement was false. I initially expressed my approval that the segment had been removed – which was the right thing to do in the circumstances – only to now be told it was due to a "back end publishing error" and incredibly find it is back on the website again. Paul needs to pursue the person in the ABC who fed him the information that formed the basis of the offending statement and also find out the person in the ABC who authorised the preparation of the map and allowed it to go on air in the misleading and deceptive form it did. “David, I won’t be entering into further correspondence about this. As I’ve said, we believe our report was fair and we have no intention of correcting it. And I’ve given you avenues to take your complaint further if you’d like to do that. For Media Watch to act in this high handed and dismissive manner is a national disgrace. Removing the segment that contained the false map was certainly the right action for Media Watch to take. Reinstating it was contemptible. Those responsible for this total fiasco should be reprimanded – perhaps dismissed. Jason Whittaker’s title should be changed to “Fake Story Editor”. Media Watch’s credibility has hit rock bottom. Media Watch itself is now centre-stage on Media Watch and clearly does not like being targeted for false reporting. Can someone please explain to me how the USA State Department has remained consistently anti-Israel for several consecutive decades, regardless of who was President? And also explain why there seems to be nothing that can be done to change it? Can Jews learn something from Captain Kirk? "A Cultural Answer to Calls for a Boycott"
Will He or Won't He Be Going to Britain?